I don’t write or speak about education very much, but, when asked, I explain that America has a very costly and inefficient government school monopoly. The strongest piece of evidence is an amazing chart put together by a Cato colleague. It shows that education spending has skyrocketed while educational performance has stagnated. One of my favorite soundbites, when discussing this issue, is that the U.S. spends more per capita than any nation other than Switzerland, but we get very sub-par results for all that money. According to new data, though, I can no longer make that assertion. I’d like to say it’s because we now get above-average results, but the real reason is because we’ve now surpassed Switzerland to become the biggest spenders on education. But we still get a crummy return on all that money that is spent. Here are the key findings from an OECD study, as reported by the AP. The United States spends more than other developed nations on its students’ education each year… Despite the spending, U.S. students still trail their rivals on international tests. …brand-new and experienced teachers alike in the United States out-earn most of their counterparts around the globe. Now let’s look at some of the grim details. …the United States spent $15,171 on each young person in the system — more than any other nation covered in the report. That sum inched past some developed countries and far surpassed others. Switzerland’s total spending per student was $14,922… The average OECD nation spent $9,313 per young person. …The United States routinely trails its rival countries in performances on international exams despite being among the heaviest spenders on education. U.S. fourth-graders are 11th in the world in math in the Trends in International Mathematics and Science Study, a separate measure of nations against each other. U.S. eighth-graders ranked ninth in math, according to those 2011 results. The Program for International Student Assessment measurement found the United States ranked 31st in math literacy among 15-year-old students and below the international average. The same 2009 tests found the United States ranked 23rd in science among the same students, but posting an average score. …The average first-year high school teacher in the United States earns about $38,000. OECD nations pay their comparable educators just more than $31,000. …The average high school teacher in the United States earns about $53,000, well above the average of $45,500 among all OECD nations. 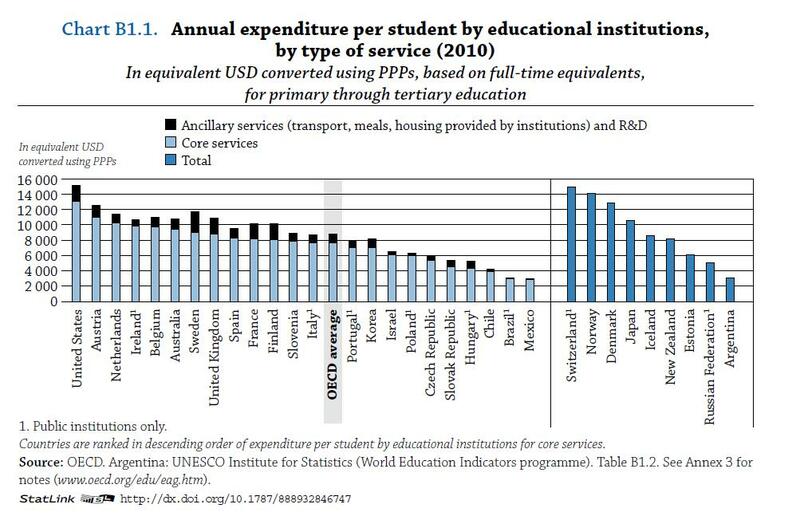 Here’s the chart from the OECD study showing per-student spending. So we spend more, pay more to our bureaucrats, yet we get worse results. Not exactly a ringing endorsement of the education monopoly. Oh, by the way, I wouldn’t be surprised if the numbers are even worse than we think. Check out this Cato video, which reveals that politicians and bureaucrats hide the real cost of their inefficient and wasteful monopoly. One reason the system is so expensive is that we squander so much money on bureaucratic overhead. But I guess we need all those paper pushers so we can stop little kids from engaging in terrorist behavior. But you have to give the teacher unions credit for chutzpah. One of the union bosses actually had the gall to ignore the actual findings in the study and to assert that taxpayers aren’t doing enough! “When people talk about other countries out-educating the United States, it needs to be remembered that those other nations are out-investing us in education as well,” said Randi Weingarten, president of the American Federation of Teachers, a labor union. Not that I can blame union bosses and other defenders of the status quo. They’ve got a great scam going, so why not blatantly prevaricate in hopes that the gravy train will continue. What makes this situation so tragic is that we have strong proof that we could get much better outcomes by shifting to a system of school choice. But that’s a difficult fight. The teacher unions understandably want to preserve their undeserved privileges. What really irks me, though, is that some people side with the unions for political purposes, even though it means they deliberately sacrifice the best interests of children. That’s a harsh accusation, I realize, but I think it describes both President Obama and the NAACP. All the more reason to get government out of the education business. Though this is not just an issue of government inefficiency. Other nations have government-run education systems and they spend less and produce better results. In a few cases, such as Sweden and the Netherlands, It’s quite likely that school choice helps to explain better outcomes. But what about other nations? Is there something about the American system that makes it especially wasteful? Dan: Great article. I do have a question about the OECD chart–why the split? Are Norway and Sweden on a different scale?